The only fast-food restaurant that I will eat at is Chipotle Mexican Grill. I can order a delicious vegan burrito or salad and I feel like I'm eating healthy. Here's my version of their burrito bowl. This salad has a lot of components to it, but you can choose to make whatever components you like. Also, you can purchase the roasted tomato salsa, and use canned beans if you're in a hurry. You can use white basmati rice, but I used a multi-grain rice made up of brown and red basmati, black barley, red radish and wild rice. Every time that I purchase a different kind of rice in the bulk section of the grocery store, whatever is leftover goes in the container and mixed together. It's healthy, nutty, crunchy and nutritious. When you cook rice, use a 2:1 water to rice ratio. For this dish, I used 1 cup of rice and cooked it for 35 minutes on medium-low and then let it sit for 10 minutes covered off the heat. Mix in 1 tbsp minced cilantro and the juice of a 1/2 lemon and salt and pepper to taste, keep covered and set aside. I always use dried beans when I cook, but you can use canned (rinsed well) if you don't have time. You don't need to soak the beans overnight before cooking. Add 1 cup of beans to a 3qt sauce pan, cover with lots of water, add 1 tsp dried oregano, 1 tsp chili powder and 1 bay leaf. Bring to a boil, reduce to medium-low and simmer for about an hour until tender. Season with salt and pepper and set aside. Preheat broiler to 450-500. Please tomatoes, tomatillos, jalapeno and red onion on a sheet tray and broil until charred on all sides. Keep an eye on the vegges because they will char at different times. The tomatoes will take the longest, but the onion will char quickly. You definitely don't want everything burned to a crisp! Let vegges cool to room temperature and pulse in a blender. Do not peel them before blending. Add seasonings, lime juice, salt and pepper to taste, and pulse again. Add salsa to a bowl, stir in minced cilantro and place in the refrigerator for at least an hour for flavors to blend and salsa to chill. In the summer when corn is in season, I would use two ears of fresh corn, roasted on the grill and then remove the kernels from the cob. However, for this recipe I used frozen corn kernels instead. Combine all ingredients in a bowl and mix well. Place in the refrigerator for at least an hour for flavors to combine. Peel, remove seed and mash avocado with a fork in a bowl. Heat a saute pan on medium heat, add canola oil, onions, green peppers and oregano. Saute on medium until slightly soft and lightly charred. Add lemon juice, salt and pepper to taste. 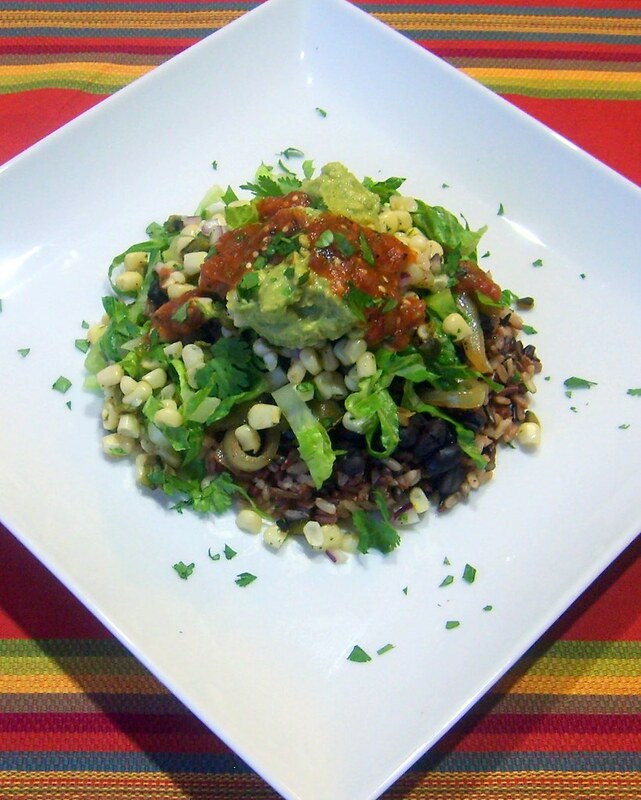 Last but not least, shred some romaine lettuce, pile it all on a plate starting with the rice and ending with the salsa! A great combination of flavors and textures...just delicious!